We were a bit worried about today as we were dropped in Edinburgh and had to stay all day until after the tattoo (8am until midnight). It was raining as we left the hotel and we thought we would have a wet, cold day ahead of us. Keith, in his kilt, walked us up the Royal Mile and into the castle (still raining, but only light). We were then left to our own devices to look around the castle. We then did the Scotch Whiskey Experience which houses the largest collection of whiskies in the world (over 3400 different scotches, all unopened, value undisclosed)! Did a whiskey appreciation course and a tasting, before checking out their collection of different whiskey bottles/containers, which was also pretty amazing. Very busy on the Royal Mile with all the festivals on, and we were getting leaflets for all the events thrust at us from left, right and centre, so quickly got out of there and headed over North Bridge to New Town to have some lunch. Did a 1 hr tour on the green bus, just to fill in time and get out of the rain for a while. The clouds started clearing after this (just in time for dinner and the tattoo!) Drinks at Waterloo Bar (McEwans ale) before heading to Grayfriars for dinner. 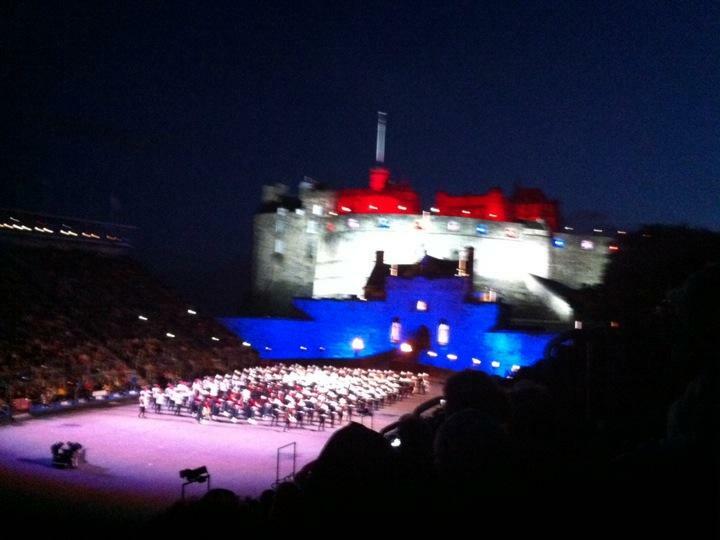 Had to walk from the bottom of the hill up to the castle but it was worth it - the show was amazing! The precision marching, the lighting effects and fireworks were fantastic (not as much bagpipes as I expected, more international dance troupes and bands). 1am bedtime so pretty shattered.